Technology has become a foundation upon which today’s athletes could build upon and make more of their capabilities. Coaches, clubs and other entities in the sporting world have begun to realize and realign themselves to this disruption. Sports technology offerings thus fit well at the intersection of B2B and B2C. It harbors possibilities to proliferate into lives of the general population pretty much like how product outcomes of space research became part and parcel of our daily lives. Service and solutions portfolio in this realm range across sports software and analytics, wearable tech, tracking systems, broadcast technologies and improved equipment vendors; however, in the long run, technology shouldn’t turn out to be a burden on the implementer. It is therefore imperative for concerned decision makers to thoroughly evaluate the offerings in a market that is witnessing a rising competition among vendors. 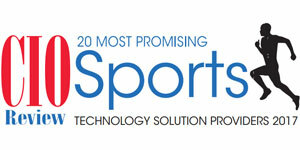 In this edition of CIOReview, we present you the “20 Most Promising Sports Technology Solution Providers 2017”. In the last few months, a distinguished panel comprising of CEOs, CIOs, VCs, and analysts including CIOReview editorial board reviewed the top companies in the domain, and shortlisted the ones that are at the helm of tackling challenges of the sporting world. The companies compiled in this issue have exhibited extensive business process knowledge, along with in-depth, integrated, and innovative strategies in the space.